I can’t remember selling Girl Scout cookies in fourth grade. Most of the brief season with my Brownie troop remains a mystery. Martha Bradley comes to mind. Her mother led our meetings at their home. Mrs. Bradley dressed like a Girl Scout and smiled a lot. She led us in the Brownie Pledge. Brownie meetings were fun like Friday night Pioneer Girls at church. We learned a lesson, sang songs, and ate a snack. I was amazed that mothers led Brownie troops throughout Michigan, the United States, and the world! I remember the day Mrs. Bradley demonstrated how to assemble potatoes, carrots, and beef chunks on aluminum foil to make a hobo pie. We shook on salt and pepper then folded the foil over and sealed it around the edges. We carried our hobo pies into her backyard to a pile of wood. There our leader taught us a fire safety lesson. Then she placed a grill above the flames where we cooked our food. We sang camp songs new to me. One was a verse about a smile in our pocket. No wonder Mrs. Bradley smiled so much. At first taste, that one hobo pie of my lifetime fixed a steadfast hobo pie molecule in my food DNA. Just when I thought Brownie meetings and food couldn’t get any better, Mrs. Bradley doled out the fixings for S’mores. You mean graham crackers, a Hershey bar, and roasted marshmallows make something so delicious you want “some more?” The S’more molecule entwined the hobo pie’s. My second Brownie memory is a fine, delicate vision inside the former Ford Auditorium filled with hundreds of red cushioned seats. My troop sat in a row toward the back. An empty stage lay in front. The lights dimmed. Slow, beautiful music began and swelled in volume from some invisible place until it filled the spacious high ceiling. My skin tingled. 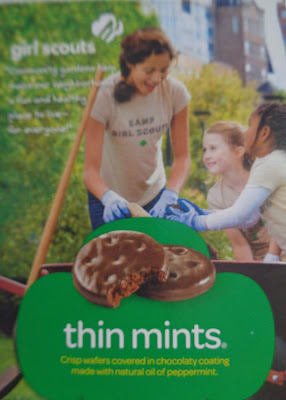 Dear Reader, come March, when I have several boxes of Girl Scout cookies stashed in our freezer, I pour hot cups of tea and melt Thin Mints in my mouth. I celebrate my indelible Brownie lessons and adventures. The hobo pie and S’more. A blazing bonfire and beautiful ballet. I hum the silver and gold song, take to heart the good advice for friendships fallen upon stony ground. On my honor, I will try to serve God and my country, to help people at all times, and to live by the Girl Scout Law.